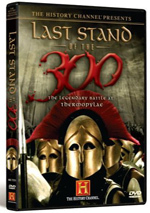 300 appears in an aspect ratio of approximately 2.40:1 on this Blu-ray Disc. Across the board, the transfer satisfied. Another stylistic choice affected the colors of 300. Essentially, the movie came devoid of most hues, as it often favored either a mild golden tint or a chilly blue tone. Occasionally I saw slightly warmer colors like some rich reds, but those were rare. Within the film’s design, the hues looked solid. Blacks were deep and dense, while shadows seemed clear and smooth. Despite the distraction of the intentional grain, this was a solid visual presentation. In addition, 300 boasted an excellent Dolby Digital TrueHD 5.1 soundtrack. Like the movie itself, this was a constant assault on the senses, and it added serious punch to the piece. The soundfield used all five speakers to terrific advantage, especially during the battles. All the elements of war swarmed around us and created a fine sense of the setting. Even quieter scenes – which filled about three minutes of this aggressive film – still offered good ambient information. This was a powerful soundfield that placed its pieces well and combined them to work well. How did the picture and audio of this Blu-ray compare to those of the original DVD release? I thought the DVD looked and sounded quite good, but the Blu-ray provided a step up in terms of the presentation. The soundtrack had a bit more kick to it, and the visuals demonstrated a nice elevation in terms of clarity and vivacity. I still think the DVD is more than satisfying, but the Blu-ray is spectacular. In terms of extras, this “Complete Experience” Blu-ray offers the same extras from the 2007 Special Edition plus some new elements. I’ll indicate exclusives with blue print. 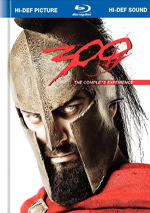 The main new attraction comes from The Complete 300: A Comprehensive Immersion. An introduction from director Zack Snyder starts the experience. He chats for two minutes, 12 seconds as he details the different “paths” available as part of the “Immersion”. What are those “paths”? We find “Creating a Legend”, “Bringing the Legend to Life” and “The History Behind the Myth”. Taking them in that order, “Creating” looks at the graphic novel and its creation. In “Bringing”, we focus on the efforts required to make the film. Finally, “History” lives up to its title, as it looks at the facts behind the movie’s fiction. Across these features, we see shots from the set, pre-viz elements, text trivia and interviews. They provide notes from author/artist Frank Miller, writer/director Zack Snyder, producers Gianni Nunnari, Bernie Goldmann, Deborah Snyder and Mark Canton, editor Bill Hoy, historians Bettany Hughes and Victor Davis Hanson, creature effects Mark Rappaport, DC Comics group editor Bob Schreck, production designer Jim Bissel, VFX supervisor Chris Watts, composer Tyler Bates, screenwriter Kurt Johnstad, director of photography Larry Fong, creature and special makeup effects supervisor Shaun Smith, assistant stunt coordinator/fight choreographer Chad Stahelski, stunt coordinator Damon Caro, comic book creator Neal Adams, DC Comics president/publisher Paul Levitz, and actors Gerard Butler, Lena Headey, Dominic West, Vincent Regan, David Wenham, and Rodrigo Santoro. “Immersion” offers a few ways to experience its information. If you’d like, you can simply select one of the three paths and let it run. The good part of that is that you’ll see everything without disruption, and it requires no input as you watch. Unfortunately, it means you’d need to sit through the movie three times to go through all three. Not only is that a lot of time, but also none of the three paths provide continuous data, so you’d experience a lot of dead space along the way. The method I thought worked best came from the disc’s ability to switch paths on the fly. In the top left corner of the screen, you’ll see colored boxes that correspond to each of the three paths. When information pops up in any of the three routes, the appropriate box will bob up and down. Click the correct colored button on your remote and you’ll jump to that path. All three ways you can use to experience “Immersion” have their flaws, but “on the fly” one worked best for me – or at least it annoyed me the least. Really, would it kill Blu-ray producers to find a simple “play all” option for streaming features like this? I don’t think so, and that would make it much less frustrating to go through the material. Anyway, if you put yourself through all that, you’ll find a lot of good information about the movie and the source material. I probably like “History” the best, and only partly because Bettany Hughes is gorgeous. The rest of the disc includes plenty of movie-making information, so additional historical content becomes particularly valuable. “Bringing” also works well, but “Creating” seems a little disappointing. I thought it’d dig into the graphic novel in a complex way, but instead it feels more like an extension of the movie-making info. It has its moments but doesn’t really deliver what it promises. Also found strewn throughout the “Immersion”, we get 40 Focus Points. These short featurettes feature Zack Snyder, Goldmann, Miller, Nunnari, Wenham, Regan, Butler, Rappaport, Watts, Headey, Fong, Bissel, Smith, Bates, Hoy, Hughes, Hanson, Canton, Santoro, Johnstad, Stahelski, Caro, visual effects art director Grant Freckelton, producers Jeffrey Silver and Wesley Coller, special effects Mario Dumont, and trainer Mark Twight. All together, they fill a total of 34 minutes, 56 seconds. The “Focus Points” offer the same kinds of video blurbs found elsewhere in “Immersion”. They continue to inform, but the interface remains somewhat problematic. Why not offer a “View All” option for these – or at least list them in their own area, as the producers of the Watchmen Blu-ray did? The “Points” have good material but can be a chore to watch. Now that we’ve finished with “Immersion”, we head to an audio commentary with director Zack Snyder, writer Kurt Johnstad and director of photography Larry Fong. All three sit together for this piece, though Snyder heavily dominates the proceedings. Another component not found on the DVD, Bluescreen Picture-in-Picture provides two new elements. As the title indicates, we see the whole movie as shot on the bluescreen set. This appears as an inset box in the bottom left of the screen and we can compare this with the final film. That would be interesting enough on its own, as it’s cool to see how the movie looked before all the CG backgrounds and effects were added. As a bonus, the “PIP” also includes a new commentary from Zack Snyder. He discusses a lot of technical areas in this chat. That makes it not terribly different from the “main commentary”, but at least the emphasis on the technical side of things makes sense. He provides good notes about what we see and compares the raw footage to the finished film. It’s a dry commentary but it fulfills its goals. The 24-minute and 32-second The 300 – Fact or Fiction? mixes movie clips, behind the scenes bits, and interviews. We hear from Snyder, authors/historians Bettany Hughes and Dr. Victor Davis Hanson, writer/executive producer Frank Miller, and actor Gerard Butler. The show includes some historical notes about the Spartans and comparisons between those facts and the movie’s fiction. We also learn about Miller’s graphic novel and its film adaptation. All those factors combine well in this pretty enjoyable piece. It manages to give us a nice examination of how 300 fits with history and fleshes out those facts to a satisfying degree. It should help expand fans’ enjoyment of the film since it broadens their understanding of the material at hand. For more historical information, we find the four-minute and 24-second Who Were the Spartans? The Warriors of 300. It features Snyder, Miller, Butler, Hanson, Hughes, and actors Rodrigo Santoro and David Wenham. “Warriors” expands on “Fact” as it examines the culture of the Spartans and their society. It’s not as good as “Fact”, but it offers a decent addition to the set. Preparing for Battle: The Original Test Footage lasts six minutes, 43 seconds and includes notes from Zack Snyder, Miller, Nunnari, Canton, and Deborah Snyder. We see a reel adapted from the original graphic novel to demonstrate what Zack Snyder wanted to do with the project as well as some other elements used to pitch the project. It’s a cool glimpse of the filmmakers’ intentions. Next we find 12 Webisodes All together, they go for a total of 38 minutes, 20 seconds. These present remarks from Snyder, Headey, Butler, Santoro, Miller, Johnstad, Twight, Wenham, Watts, production designer Jim Bissell, costume designer Michael Wilkinson, stunt coordinator/fight choreographer Damon Caro, assistant stunt coordinator/assistant fight choreographer Chad Stahelski, creature shop supervisor Mark Rappaport, special effects makeup supervisor Shaun Smith, and actors Vincent Regan and Dominic West. Quick promotional bits, these look at production design, wardrobe, stunts, the graphic novel’s adaptation, the actors, their characters and their training, visual effects, and some aspects of Spartan culture. Even though the “Webisodes” clearly exist for publicity purposes, they still often manage to provide good information. The first three “Webisodes” deal with production design, wardrobe and stunts, and those prove especially valuable. I also like the ones that check out visual effects, training, makeup and characters. Most of the others tend to be somewhat fluffy, but all remain enjoyable. The set also boasts a digital copy of 300. This feature allows you to easily move the film onto a portable media device. If that works for you, have fun! 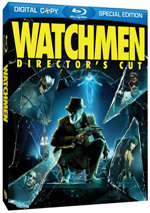 The Blu-ray opens with a promo for Watchmen. No trailer for 300 appears anywhere in the package. Finally, the Blu-ray release includes a hardcover book. This comes as part of the package; open up the disc’s casing and the book appears on the left half. It features a mix of components. It throws out a description of the “Immersion” experience along with production notes, photos and biographies. It finishes the set in a nice manner. Possibly 2007’s biggest cinematic disappointment, 300 takes an interesting premise and turns the material into laughable schlock. I feel absolutely perplexed that this ripe cheese maintains such a big audience of folks who love it, though I’ll go out on a limb and opine that they’ll be embarrassed by it within the next 10 years. This is a terrible piece of overacted, overwrought and over-dramatic action trash. As for the Blu-ray, it offered excellent picture and audio with a terrific roster of extras. Obviously I can’t recommend the film to new fans, as I don’t enjoy it. 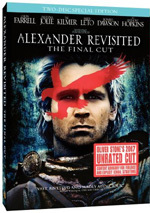 Those with a pre-existing affection for 300 will want to scarf up this Blu-ray, though. It’s the best release of the film to date.